It's hard to know how to categorise Pam Smy's Thornhill. It's not really a novel with illustrations, because the many beautifully drawn pictures are the only means of telling a large part of the story rather than accompanying the text, and it's not a graphic novel either as the other half of the story is told in pages of continuous prose. My copy is a hardcover edition and I must say it would make a beautiful Christmas gift - the book itself is a beautiful object and the artwork really deserves to be appreciated on paper; this is not a book to be read on a tablet or Kindle. Thornhill begins with a young girl, Ella, moving to a new house with her father in the summer of 2017. Backing on to their new garden is Thornhill, a former children's care home which closed in 1982 and has been unused ever since. Ella, who has recently lost her mother and whose father is frequently absent due to the pressures of his job, one day spots another girl of about her age playing in Thornhill's long-neglected gardens. Resolving to find out who the girl is, Ella climbs the fence to investigate and starts to uncover some of Thornhill's secrets. This part of the story is told solely through numerous full-page pictures. Meanwhile, back in 1982, 13-year-old Mary is a resident of Thornhill. Mary, who has selective mutism, is bullied by the other girls - in particular, by one unnamed girl whose pretty face and blonde curls conceal a seemingly sociopathic personality. Mary is desperately lonely and spends most of her days hiding in her room, where she reads novels about other lonely girls in large houses, such as Jane Eyre and The Secret Garden, and painstakingly crafts handmade puppets. Mary tells her story entirely through diary entries. The diary sections are not perhaps written in a way that you'd expect a 13-year-old to write, but then again, Mary isn't an ordinary 13-year-old and it seems fitting that her voice feels like the voice of a child who is different. As a selective mute, Mary is largely incapable of speaking in her normal daily life, but in her diary, the words come freely and chart her troubled progression from fear and loneliness to bitterness and anger with chilling plausibility. The artwork, which tells Ella's part of the story, is really remarkable. Using only black, white and shades of grey, Pam Smy has created a shadowy world of semi-derelict buildings, dimly flickering lights in attic windows, overgrown gardens and faded newspaper clippings - there's a sort of suburban gothic feel about them which make the images feel convincingly realistic as well as creepy, and the story is all the more chilling for it. I picked up Thornhill in the young adult section of Waterstones and although the copious pictures and relatively short passages of text would probably make it an easy read for younger children too, I'd warn that while the pictures are enchanting this story is no fairytale. Mary's accounts of her daily life at Thornhill, humiliated by bullies and ignored for fostering, are bleakly sad and when Mary and Ella's paths do finally cross, things don't pan out at all as I expected them to. 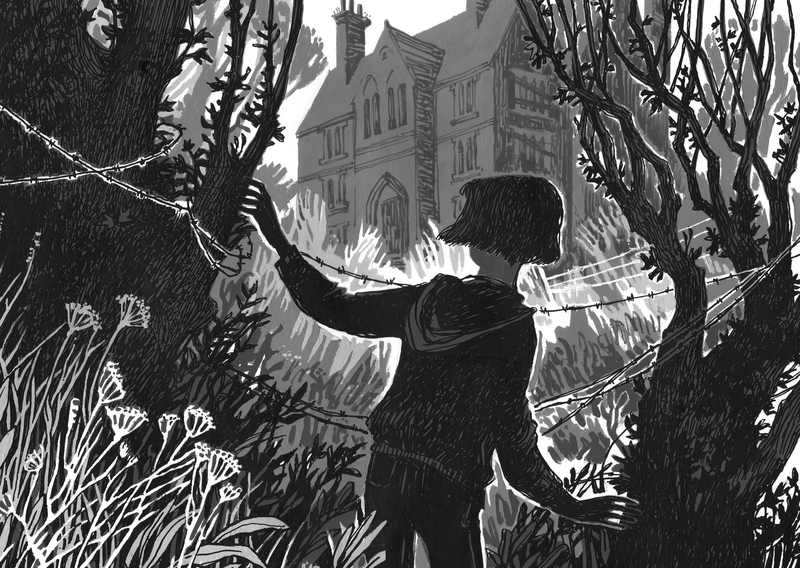 Thornhill is a beautiful ghost story but it's also a tragic one, and more sensitive pre-teen readers might find elements of it upsetting. I don't believe in age restrictions for books, but the two girls in the story are both 13 and if I had to I'd recommend this one primarily for readers in the 12+ age bracket with a suggestion that younger kids proceed with caution. 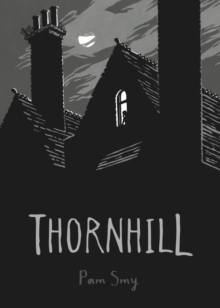 I found Thornhill a haunting story, told through words and pictures in a way quite unlike any other book I've ever read. It certainly stands up very well as an adult read and the ending doesn't tell the reader what to think - my feelings upon finishing it were complex and conflicted. It also made me think about the sheer harm that loneliness can inflict and how poorly we, as society and as individuals, look after children so full of sadness - not just children like Mary, but children like Ella too.